Located in the historic Salmon Falls Mill, the Rollinsford Public Library opened in 2008. We offer a 12,000+ title lending library and over 1000 DVDs, free WiFi, printing, scanning, and faxing services, children’s programs, museum passes and discounts to local cultural and scientific institutions, community meeting rooms, free community yoga, and more! Closures and program changes can be found in the RPL calendar or on our Facebook page. RPL TRUSTEES MEETING The RPL Trustees meet on the 3rd Monday of the month at 6pm in the library. All are welcome! Community Yoga is held every Thursday at 6:45 PM in the library's Community Room. All levels welcome. Join anytime! Search the RPL catalog using Atriuum. To reserve or renew a book online, log in to Atriuum: Your USERNAME = your full library card number, and your PASSWORD = the last 4 digits of the phone number you used when signing up for your library card. 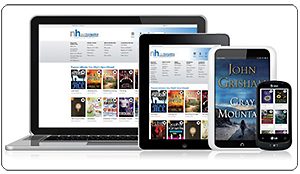 You can borrow e-books and audiobooks any time with RPL’s OverDrive account! Learn more on our eLibrary page.